Capt. Moore: “Great Pacific Garbage Patch (is) Much Worse” – Neptune 911! All boldface comments were highlighted by Neptune 911. All photos are from the Neptune 911 collection. Listen to the crew. They have now experienced the “Great Pacific Garbage Patch” first hand, and it has changed them. I have been there ten times over the last 15 years. It has gotten much, much worse. I was shocked to see what was an uncommon occurrence during my first voyages—an area of concentrated floating plastic visible to the naked eye—now persist over hundreds of miles, with these areas being the rule, not the exception. Some of this floating plastic was tsunami related, but much was Chinese, not Japanese. Asia will continue to adopt the throwaway plastic lifestyle. People will continue to live in the coastal zone. Plastic will continue to dominate the consumer, construction and agricultural marketplace. Aquaculture, that uses huge amounts of plastic infrastructure, will increase. The world will continue to experience great tsunamis, storms and other disasters, both natural and unnatural, which will wash tons of plastic into the sea. 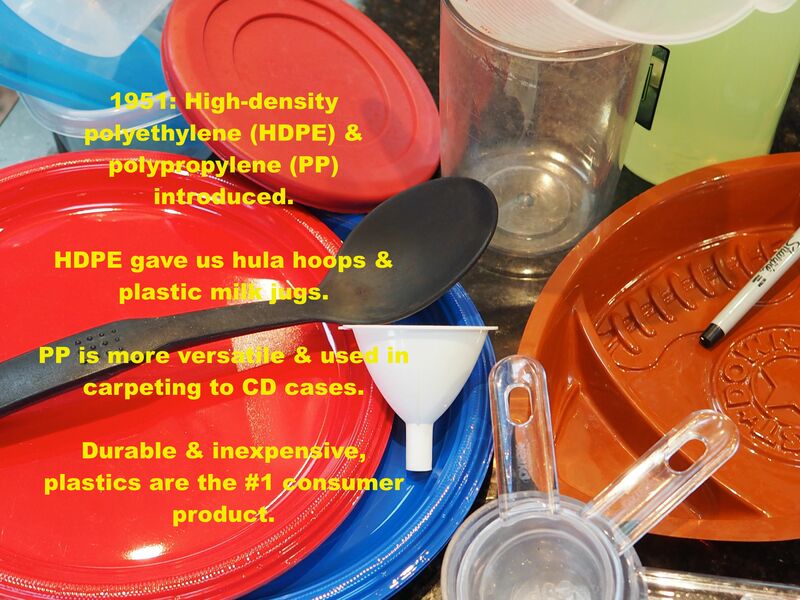 Recycling will lag far behind innovation of new, difficult to recycle plastics. Progress toward benign plastics will be slow. The Garbage Patches will grow. How much the one we study has grown will be my work for the next couple of years. Algalita Marine Research and Education will continue to raise the issue of marine plastic pollution, and make accurate information available, so that a critical mass of concerned individuals can cooperate and force the changes needed to mitigate this growing crisis in our precious ocean. poetic but I’m not. When it comes to the purpose of the voyage for me, it was to collect blood samples to analyze how the debris and the chemicals associated with the debris might affect fish within and out of the gyre. How we sampled (trawling, hand netting, purse seine, hook and line or just finding them in plastic debris) and how many we got by these methods I was; shocked, amazed, pumped-up, excited, awestruck….the list goes on and one. Really there is no one way to describe how the sampling has gone from a personal scientific point of view. I was able to collect samples from a species (myctophids) which by sheer numbers make up more than half of all fish in the world. Sampled what look like juvenile sunfish (potentially); a species so rare I don’t know if anyone has blood and tissue samples analyzed for this species. Then there are the Mahi mahi and albacore samples which bring to light the ultimate message. 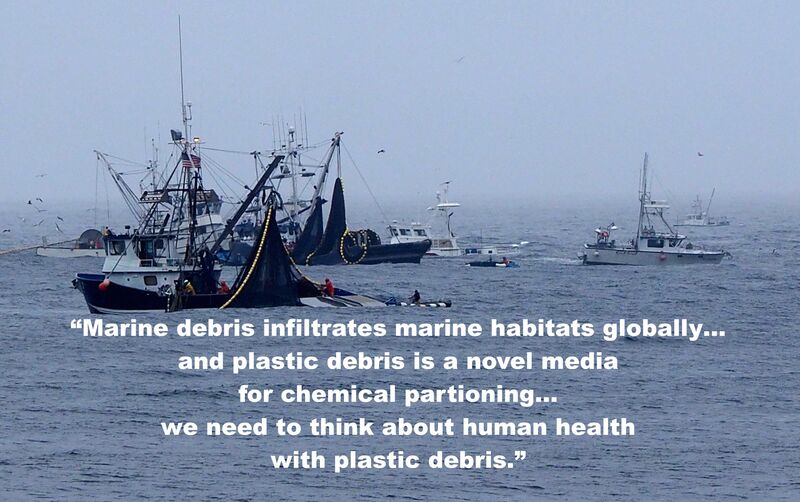 Too many times people hear about the plastic/debris in the ocean and think large pieces and a “dirty” place. But the reason I’m here is to determine to what extent this debris impacts the fish. Endocrine systems are so vital to the overall HEALTH of ANY organism (from fish to humans). So although these fish may not have high levels of a single contaminant, if their system is being disrupted they are not healthy. If you alter an organism’s growth, stress, developmental, reproductive or immune system there is no way they can be healthy. And there it is……..ultimately people have heard this before; we are tied to all environments. If we contaminate a field, would anyone eat anything grown in that field? If livestock was contaminated, would anyone eat that meat? ….so everything links back to humans and human health. It’s important to protect all our environments because it is the right thing to do, but also because ultimately we are protecting ourselves. To think of how much debris is out here, seeing copious amounts of it float by, seeing copious amounts collected in our trawls and to think we only covered a tiny micro fraction of the Pacific Ocean. Then to think of all the potential chemicals that we have released into our oceans and those that are leaching out of all those debris products making it a chemical soup more than the beautiful pristine environment that it should be……..well……..I’m speechless.